The Castle Park Association was founded in 1921 by owners of cottages/properties in the small, private lakefront community centered on “The Castle,” a grand, former home built in 1876. Over time, the Castle has been used as a personal residence, a summer school and a seasonal hotel. 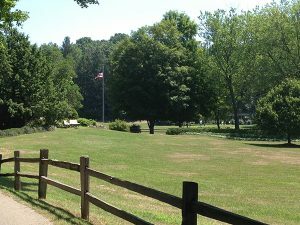 Now it’s known as the gathering spot where community spirit, goodwill and friendship reign among families and guests of Association members, whose homes dot the lanes and wooded dunes that make up Castle Park. While some homes are winterized, and some even live in the Park year-round, Castle Park officially springs to life in the summertime. Proximity to Lake Michigan means families and guests can be found on the beach, a popular place to socialize and be active. Additionally, eight clay tennis courts (complete with tennis pro, lessons and organized activities), a swimming pool, library, outdoor amphitheater, and candy and ice cream parlor offer a wide range of family activities. Castle Parkers are a social, friendly bunch and any given week during the summer, you’ll find a Friday night barbecue, a Saturday night dance, weekly Bingo, a local pub where adults gather, and a morning summer activities camp for children, ages 4-12. The Association employs two full-time managers to oversee the maintenance of the property and the administration of seasonal activities. If you find yourself in Castle Park, you’ve landed in a special place! Please Note: Castle Park is a private association. Only members and their families are eligible to rent Castle Park properties & facilities for private functions. For information about renting a cottage, please visit our page about rentals HERE.